The Gold Coast is more than "Famous for Fun" as its marketing slogan suggests. It's also more than glitter, as its playground reputation suggests. So what is attractive about the destination that has made gay and lesbian visitors travel there from far and wide? It's not the gay nightlife, though that exists. It's not the plentitude of accommodation and attractions, but it has many IGLTA members and gay welcoming operators. Perhaps it is that the Gold Coast region has become more glamourous as its glitter strip reputation has been supplanted by a very stylish essence. After Sydney and Melbourne, the Gold Coast is attracting the most new (and repeat) gay and lesbian visitors in the country, thanks to an ongoing campaign by Gold Coast Tourism operators who have joined IGLTA and hosted the Fam trip delegates. The recent IGLTA-Gold Coast Tourism FAM trip in March was a huge success, and the agents and media on the week-long experience saw the upscale side of the destination with eyes wide open. Among their experiences were designer shopping, staying at sublime waterfront accommodation, dining in spectacular settings, surfing iconic beaches, dancing at swanky clubs, and tackling other tropical treats like tasting Queensland fine wines at cellar doors. “Australia's Gold Coast has broadened its status from a top leisure destination to a gay and lesbian experiential travel hotspot,“says David Cox, Niche Marketing Manager for Gold Coast Tourism and a long-term member of IGLTA. Among the experiential activities, the group fed kangaroos, pet kolas, stood well clear of a man-eating crocodile, were awed by performing Bengal tigers, worked out on the beach with a Ironman triathlete, learned to surf after a Tai Chi exercise class, got soaked while jet boating, walked above the trees in an ancient rainforest, and played like kids at the premier theme park, zoo and water world complex. Famous for its stunning beaches, subtropical rainforests and theme parks, the Gold Coast encompasses the southeast corner of the Sunshine State and is located one hour south of Queensland's capital city of Brisbane. 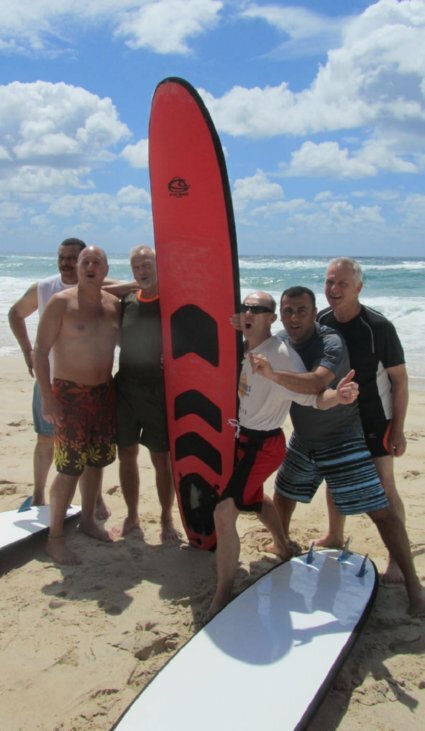 To learn more, see GayGoldCoastAustralia.com and click on the Gay and Lesbian Guide to Gold Coast Australia.